Celsius, Inc., manufacturer of Celsius, the earth’s first calorie burning soda, is an innovative sports nutrition company dedicated to bringing consumers healthier refreshment through science and nutrition. Celsius is focused on the development and marketing of healthy, performance-based beverages. A clinical research study released June 18, 2005 at the International Society of Sports Nutrition conference proved that Celsius burns calories. The double-blind, placebo-controlled, crossover clinical study showed that drinking one 12-ounce bottle of Celsius increases metabolism on average 12% for up to a 3-hour period. Celsius is regulated by the FDA for food safety and quality manufacturing, and by the FTC for product packaging claims. 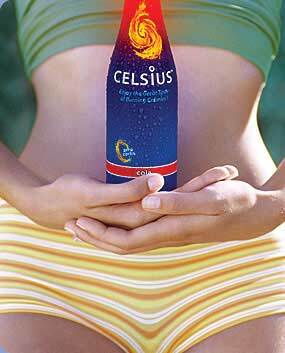 Celsius is the first soda clinically proven to raise your metabolism resulting in a calorie burn. In a double-blind, placebo controlled study the resting metabolic rate of volunteers was serially measured and it was shown that study volunteers who drank Celsius had their metabolism raised by a statistically significant higher level after drinking a single bottle of Celsius versus no statistical significance in metabolic increase from the diet cola.